1. Spray a medium frying pan with cooking spray. Sauté the onion, bell pepper and garlic until soft. Add the tomato and egg whites. Cook until the egg whites have set. 2. 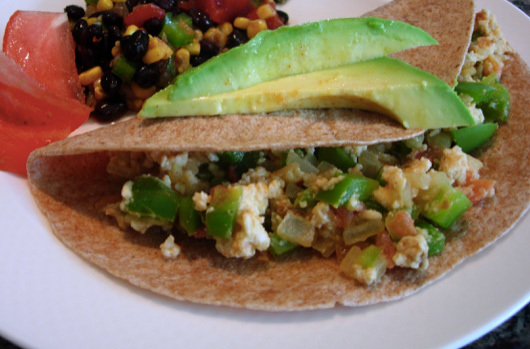 Divide the egg and veggie mixture between the tortillas and fold like a taco. 3. Slice the avocado and sprinkle it with paprika and garlic salt. Arrange the avocado on each taco and serve.